Save 50% off pre- or post-cruise hotel packages on this cruise. Click here for eligible departures. Ho Chi Minh City, still affectionately referred to by locals as Saigon, is Vietnam’s former capital. Once known as the “Paris of the Orient,” it is now an industrial, cultural and educational hub. Two lively cities, Ho Chi Minh City and Hanoi, provide the perfect start and end to your incredible journey. Cruise along the Mekong, visiting rural villages, historic pagodas, local markets and a Buddhist monastery where you’ll be treated to a special blessing by monks. Indulge your inner adventurer in Siem Reap, exploring the grand temples of Angkor Archeological Park, a UNESCO World Heritage Site. And be treated to an AmaWaterways’ exclusive with an overnight sojourn on board an elegantly appointed ship in Ha Long Bay, a UNESCO World Heritage Site. 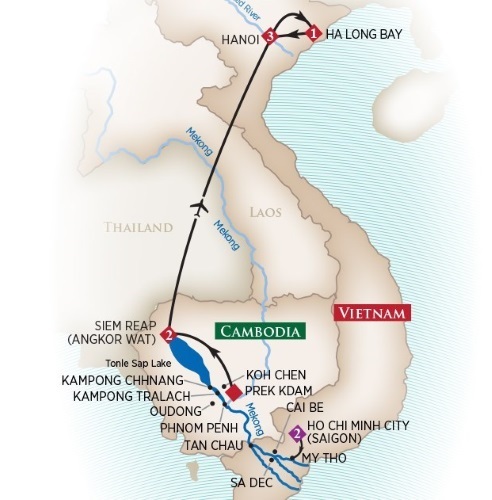 Intra-Asia Air (Siem Reap - Hanoi): Additional $360 per person including taxes and fuel surcharges. Single Supplement: Category A, B & C 50% of twin price; Suite is 75% and Luxury Suite is 100% of twin price. Please see terms below for details.